There are just two kinds of BR shooters...those who have one of Jack Snyder's Edgewood bags, and those who wish they did. Edgewood now has a website, www.EdgeBag.com. Jack handcrafts each bag to the specs noted on his website's catalog page. You select bag size (Original, Mini-Gator, Gator or Superbag), bag height, ear height, spacing between ears, and exterior finish/color. At right is the $136 "Mini Gator", 2" longer than the $110 standard bag. 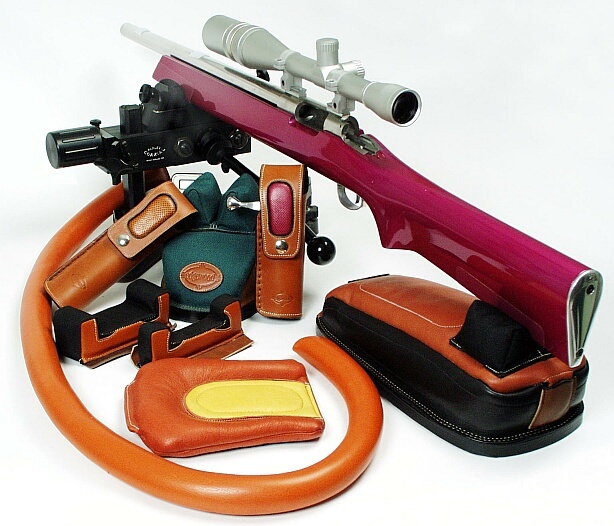 Edgewood also makes quality front rest bags, elbow pads, snakes and bolt holsters. Note: Edgewood is now stocking their front bags (both Farley and Common) in standard black, and many colors are in stock. Those not in stock can be shipped in 1 - 2 weeks. Rear bags can be shipped in 6 - 8 weeks from the time the order is placed, and they are working hard to begin stocking ALL of their rear bags! Click here to see the whole Edgewood lineup. (Giant size Photo).